An elastic band has won the Royal National Mòd amid concerns that the competitions are becoming too ‘racy’. The elastic band apparently used to be part of the elastic in a thong worn by Maggie MacPherson, the famous Gaelic drunk and singer. Judges were confused after seeing “The Elastic Band” on their entry sheets before discovering it was actually just an elastic band. 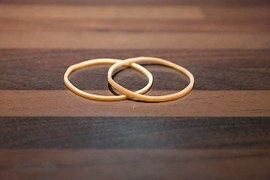 The elastic band, known to friends as the elastic band, sang a heart-breaking rendition of Soraidh Leis an Àit’, before firing into a no-holes-barred, foot-tapping version of Gur Milis Morag. Some children complained at the unfairness of the decision but were promptly harshly beaten by Mòd officials and locked up in a walk-in fridge.